“Meet the Academy” will be held on April 29 in Arizona. The event will feature a fundraising dinner, a behind-the-scenes tour of the corps’ rehearsal camp, and the group’s first public performance of 2017. The Battalion would like to hear from prospective trumpet players who would be in interested in filling a couple open positions. Blue Devils now have two bingo operations, including an operation in Suisan City, California, 27 miles north of the corps’ facility in Concord. Blue Knights has an ensemble overseas this weekend to perform as part of the 2017 F1 Gulf Air Bahrain Grand Prix in the Persian Gulf. The corps is making regular updates via blog entries and on its social media channels. Final color guard auditions for the Boston Crusaders will be held April 28-30 at Lakewood Ranch High School in Bradenton, Florida. The Cadets organization is looking for help installing kitchen equipment in the corps’ food truck. Especially needed is an electrician to advise on power distribution wiring for supply hookups, assistance in aluminum stairway fabrication, epoxy coating the floors, building rear bulkheads, plumbing, and regular wiring. “CrownGOLF: A Tasteful Golf Event” will be held on June 12 at Palisades Country Club in Charlotte, North Carolina. In addition to golfing, the event will feature samples from Charlotte’s top restaurants. 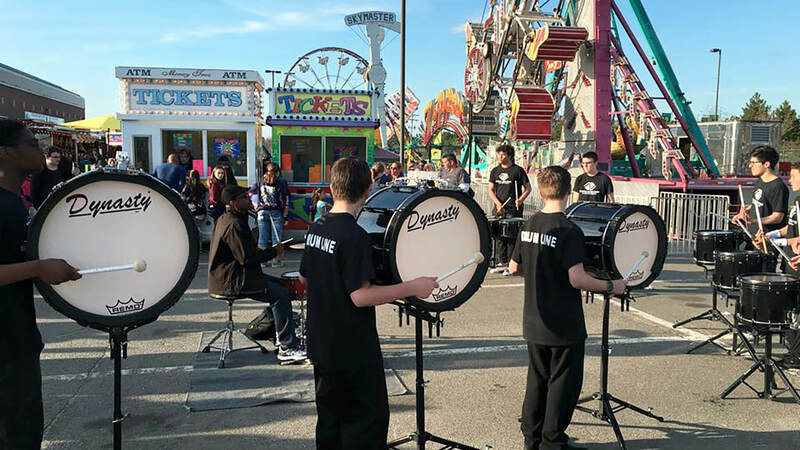 Prior to the ensembles heading to the WGI World Championships next weekend, free performances by the Cavaliers’ winter programs will be offered Saturday, April 15, in Joliet, Illinois. Colts have launched a new fundraising campaign to pay for new uniforms. Donors will be recognized on the door of the corps’ equipment truck. Columbians has openings for three color guard positions, plus a variety of positions in both the horn and drum lines. Donors to “The Big Give SA” on May 4 will get a special early look into Crossmen’s 2017 production, including a peek at the new uniforms being created by Fred J. Miller, Inc.
Genesis has two positions open for euphonium or baritone players interested in joining the corps for its 2017 season. Guardians is inviting all color guard participants to come to the corps’ April rehearsal camp in two weeks. Jersey Surf has a few performing positions available, including opportunities for color guard members. Those interested should check out the corps’ rehearsal camp April 21-23 in New Jersey. Final color guard auditions for Legends are coming up April 28-30 in Kalamazoo, Michigan. Les Stentors is holding an audition camp this weekend in Sherbrooke, Quebec, Canada. If you’d like to travel with Madison Scouts this summer, the corps is accepting applications for marketing intern positions. Oregon Crusaders has a need for CDL and non-CDL drivers, cook staff, and a tour assistant for the 2017 season. Pioneer is looking for a few players to round out its brass section at the corps’ April 28-30 and May 26-28 camps. Santa Clara Vanguard has used color guard rifles and sabers for sale at a heavy discount. Seattle Cascades announced that its Seattle Summer Music Games DCI Tour event is moving to Shoreline Stadium in Shoreline, Washington. Shadow has openings for current high school guard members and high school students who wish to learn how to spin. Spartans is hosting the corps’ annual carnival in Nashua, New Hampshire April 26-30. There will be rides and a variety of concessions. After hiring an executive chef for the 2017 season, Spirit of Atlanta has kicked off a new capital fundraising campaign to upgrade its food service. Donors to this tax-deductible campaign will help the corps receive up to $5,000 in matching funds. The Casper Star Tribune has published a story about the new Troopers exhibit at the Fort Caspar Museum.